For those of you new to this blog, our mission is to cook recipes from different countries around the world. We try to stick to traditional recipes or popular recipes for the most part. It’s been a great way for us to try new foods and learn about different cultures. My favorite part about our journey is that the kids are fully involved. They pick the countries, cook with us and of course provide their “spoon ratings” to the dish. It’s been a great experience for all four of us and we’ve learned so much – especially the kids, but us grown-ups too. But, as you may have noticed, things get a little off-focus in the summer – and we wouldn’t have it any other way. We have birthdays, anniversaries and vacations all of which we celebrate to the fullest. It’s a little taste of our family’s culture and traditions if you will. So this week, I’m putting our vacation post and French recipes on hold because Mike is whisking me away for the weekend. This week we celebrated 13 wonderful years together – a full baker’s dozen. Not to worry though, I won’t leave you without a bit of deliciousness. 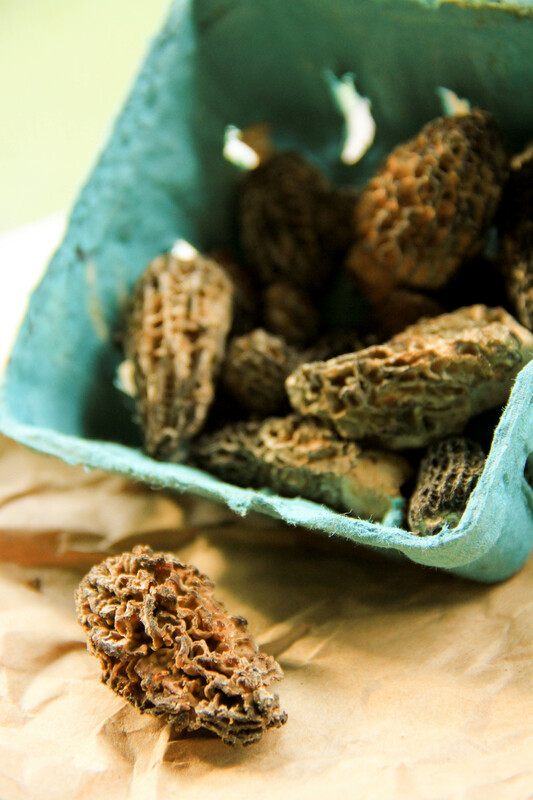 We were fortunate enough to find fresh morels at the farmer’s market this week. Instantly we knew what we were going to make for our anniversary dinner. 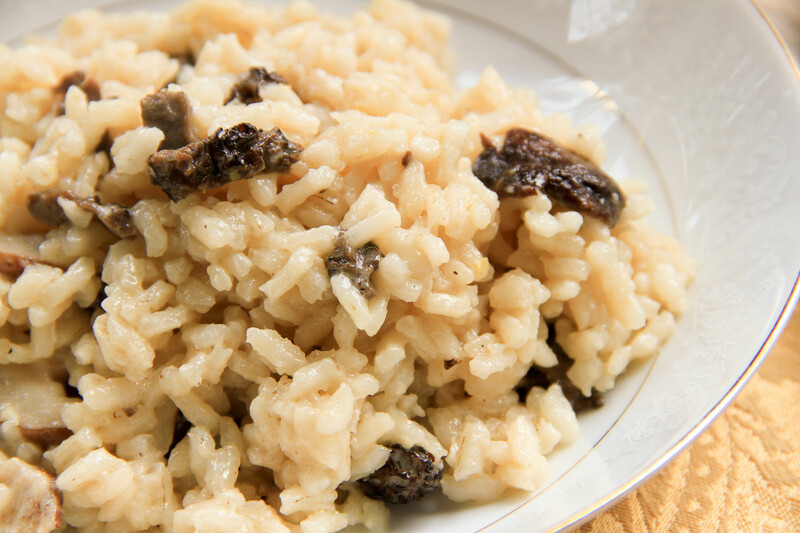 A morel risotto. 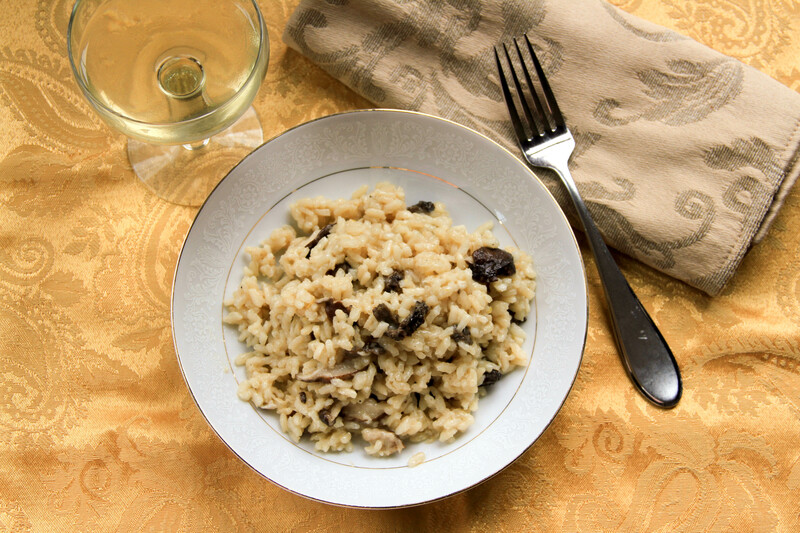 We love our risottos and we especially love an earthy, savory risotto. This recipe did not disappoint. It had that umami type flavor – at least for us. The morels are similar to a truffle. They are earthy, meaty, mushroom-y, but slightly sweeter than truffles. It was just the flavors we were hoping for and made for a fabulous anniversary dinner. Needless to say, it was four spoons for both Mike and I. We cooked and served this one after the kids went to bed. 🙂 So, if you’re lucky enough to get your hands on some fresh morels, take advantage. They certainly live up to the hype and deliver an amazing flavor. But if morels and mushrooms or risottos aren’t your thing, since Mike and I are off to Michigan I thought I’d share a few delicious recipes from the Great Lakes State. Enjoy and see you next week for our regular programming (or regular summer programming anyway). Congratulations on your anniversary. It sounds like it was lovely. It is a blessing. Marriage isn’t easy, but we sure think it’s worth it. 🙂 I hope you can find the morels as well. They are delicious! Happy Anniversary Kristy & Mike! Love the special card with fun facts about you two! 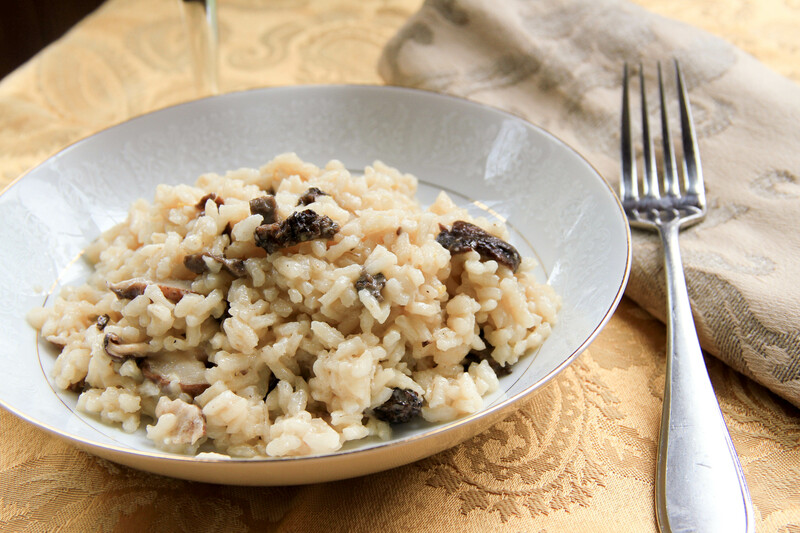 Morel Risotto looks delicious and all the Michigan recipe round up makes me hungry! Love being a part of your family blog and receive a piece of happiness from you guys! Oh, Happy, Happy, Anniversary Kristy & Mike! 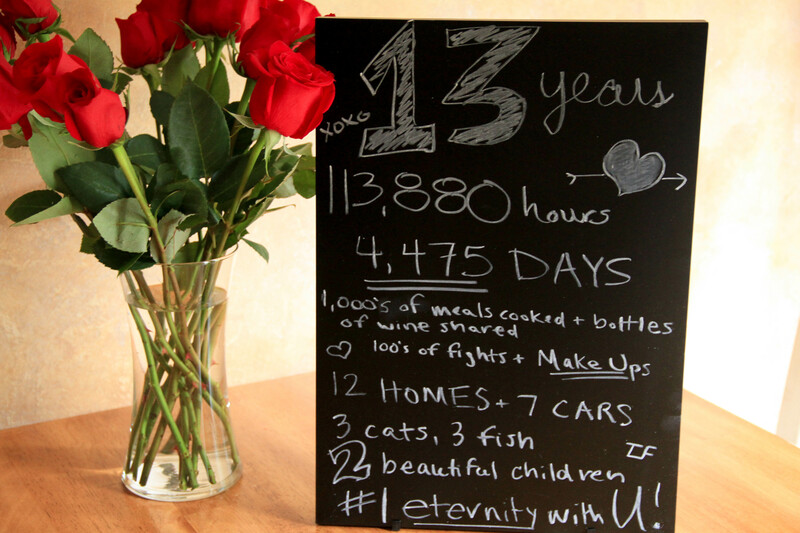 A full baker’s dozen is indeed a beautiful milestone and that chalkboard greeting is just beyond. So thoughtful! I was going to congratulate Mike for this gesture and then I realized how incredibly sexist that would be as it could have been written by either one of you! 12 homes and 7 cars — really? Wowza. Lucky you being whisked away… cannot wait to hear more about your tryst (well, the parts you want to share with us anyway ;-)). I couldn’t agree more, things should get off-focus in the summertime! May you enjoy every moment. I can think Pinterest for the chalkboard idea. It’s funny, I never really spend any time on the site, but came across this and knew it was what I wanted to do. 🙂 As for the 12 homes…our first year we moved quite a bit. Fortunately it slowed down after year two. 🙂 And our tryst was fabulous – Michigan’s rolling farm fields, forests, wineries, beaches and a quaint little B&B. Perfection. I too join in the chorus to wish you and Mike Happy 13th Anniversary. Wishing you many, many more. Happy 13 years!! I hope you had a wonderful anniversary. I’ve never had morels. They are on my foodie bucket list! Thank you Sawsan. We did do a lot of moving early in our marriage (Mike was picking a grad school). Then once he finished his Phd we moved for his job, then moved back again. We’ve actually been in our house now longer than anywhere else. It feels good – but strange too. 😉 Enjoy your cherries – I need to go get some more for the weekend as well! Happy anniversary Kristy and Mike! What a lovely benchmark, particularly in this day and age. I remember my first morel experience — we were visiting friends in Stein Am Rhein just outside Zurich and my friend Sylvia bought fresh morels, OMG! What an incredible flavour. She also made a very delicious risotto. The creamy texture goes so well with the earthy, sweet flavour if the morels. Hope your weather has been nice, we’re experiencing more fall like temperatures and lots of rain lately. We almost turned in the heat at the cottage last night :(. Fortunately the weather on our getaway cooperated. Since we’ve been home it’s been cold and wet. Miserable for a summer. I just keep hoping it will get sunny and hot. I’m craving hot weather terribly! Thank you for the anniversary wishes. Thirteen years is amazing. It’s not always easy, but totally worth it! All years, even 27 has its challenges and rewards, the key is to keep your mind and ears open. Happy Anniversary! Way to go, Mike, whisking away your Bride for a fantastic weekend! I hope you two have a wonderful time. Oh! That’s a great round-up you gathered for us. Yum! It was wonderful of him to whisk me away. 🙂 Loved every minute of it! It’s hard to beat Michigan. It’s only a few hours away, but feels a world away. I have such fond memories of my husband (boyfriend at the time) in NYC looking at the morels at Dean & Deluca longingly. One year he bought me some for a gift… Congratulations Kristy!!! I hope you have a fantastic weekend away!! Congratulations! We love morels up here in northern Michigan! Have a lovely trip – it’s beautiful up here this time of year. Oh my God, you’ll laugh – I was reading down and then I saw the photo and that distracted me so I started reading the sign and my brain started thinking it was for Mr N’s birthday (yeah, I know… 13…? Not just yet I don’t think). I started reading down the list and I was all like “bottles of wine shared?? O.o”. LOL! This cracked me up! That said, Mr. N will be 13 in no time I’m sure. Only four more years!!! Ack! No wine for him at 13 though (or at 9). Morels definitely look funny. If I hadn’t heard such wonderful things about them, I might have been deterred from trying them. Glad I did though. You would most certainly like them – they are like a fabulous mushroom. Happy 13th anniversary to you both. What a lovely couple you are and such an inspiration to us all. Thank you Mandy! You and Pete are as well! Congratulations on the 13th anniversary. What a lovely dinner assortment. 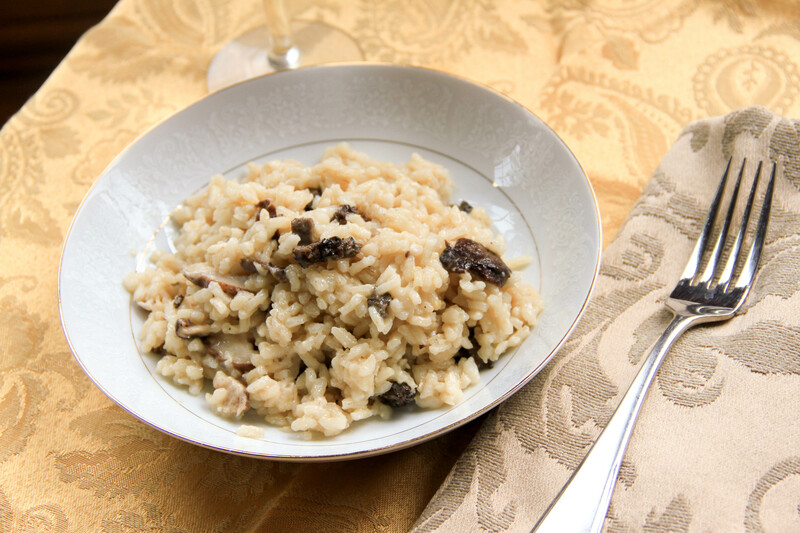 I’ve only made risotto once … a long time ago and pre-camera days but it was very tasty. Definitely time to make it again though unfortunately I probably won’t be able to find morels to use. I do have some tasty black truffle oil that I can drizzle over a saffron version. Congrats on 13 years! What a beautiful journey you are going through…. and thanks for sharing it with your lucky readers…. Wouldn’t that be lovely to win the lottery! 🙂 Thank you Sally! I think it’s fun we were married in the same year. It has been a great journey so far. Can’t wait for more to come!